As the keyboard is now driverless, it makes heavier use of Fn keys. 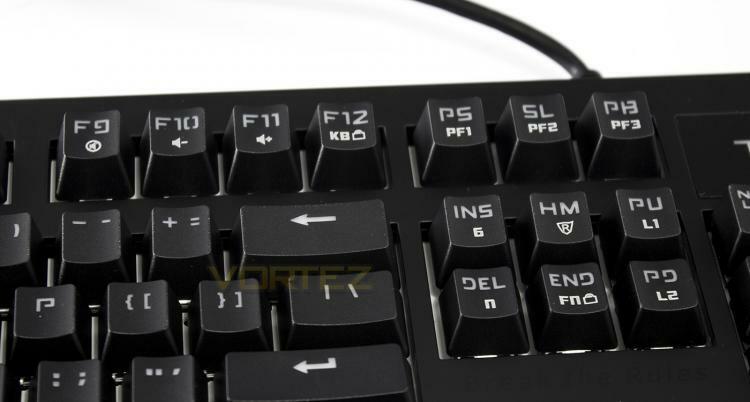 F1-F4 are reserved as macro keys, while F5-8 allow the user to adjust the keyboard repeat-rate. Moving along the keys, F9-F11 double up as volume controls, and F12 is a keyboard lock. Print screen, scroll lock and Pause/break act as profile selection keys. Insert/delete allow you to toggle between 6KRO and NKRO, the home key is the macro record button, and end acts as an Fn lock. Page up allows you to record your own static lighting effect, while page down allows you to record a dynamic lighting effect. You can also swap between static colours by pressing FN + menu. For more information on the commands visit here. Finally, the cursor keys supply users with a brightness up/down, along with lighting mode selection, of which there are 10 different effects. Side on we get an impression of the overall height of the keyboard. The tapering height is relatively shallow, and so some may prefer to use the angle adjustment feet, which unfortunately we found to be relatively unstable. The underside is mostly plain with just the product information, some rubber pads and the and height adjustment feet to note. The height adjustment feet open out, but easily collapse if you push the keyboard back a little, not a huge problem, just note that if you use them, you may need to lift it to move it backwards. The switches look a little less busy than other mechanical switches internally, and the larger switches use a metal distribution bar. 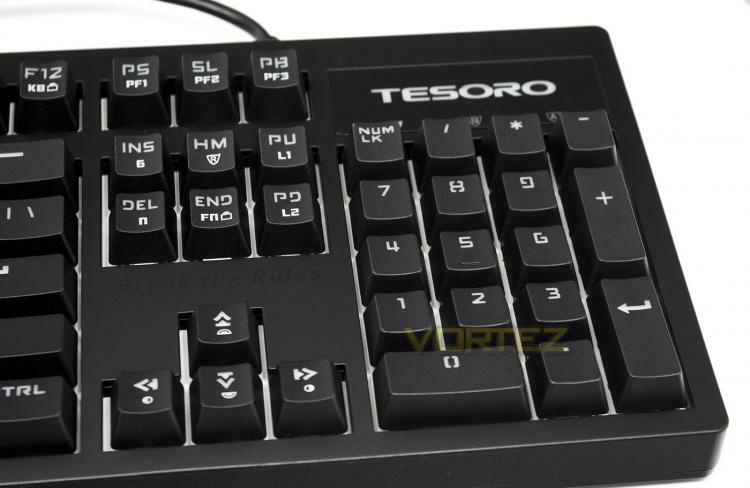 They feature the Tesoro name on them and are coloured in a dark blue to symbolise the market understanding that these have been given an audible, and tactile click on each keystroke. 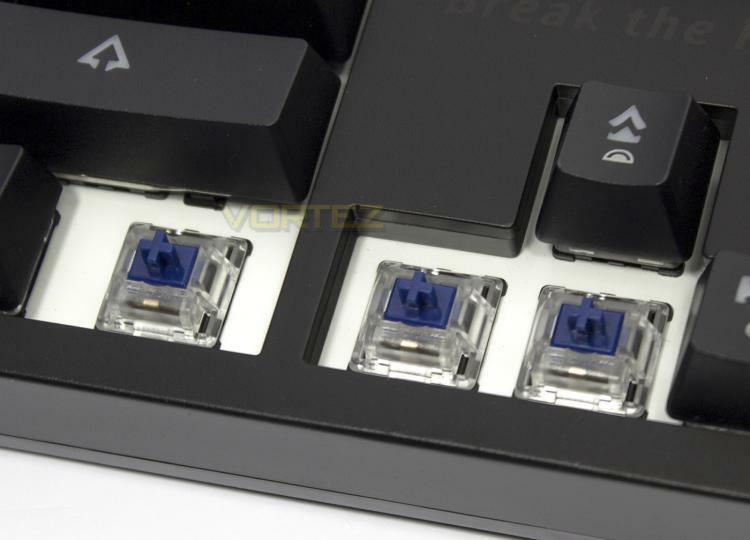 The switches can also be taken out and swapped with other compatible switches, meaning that you could potentially mix and match your favourite switches. For now however, Tesoro only have linear Red and clicky Blue available as optical switches. There are 10 various lighting modes including: breathing, static, rain, wave, cycle, ripple. You can record your own custom lighting via Fn + Pg up for static lighting effects. On entering the mode, you can press each key you wish to light up. To change the colour, press the key again to cycle through various colours until you find that which you desire. You can also record a dynamic lighting effect by pressing Fn + Pg down. This mode will record each keypress with actual delays, so it can be fairly complex to work with, though with a little practice, you can create some cool effects, unfortunately the colour of the key presses alternate after each key has been pressed, so you have no control over colour in this mode. The lighting is not as vibrant or bright as other keyboards and the colours have a strange washed out look to them. 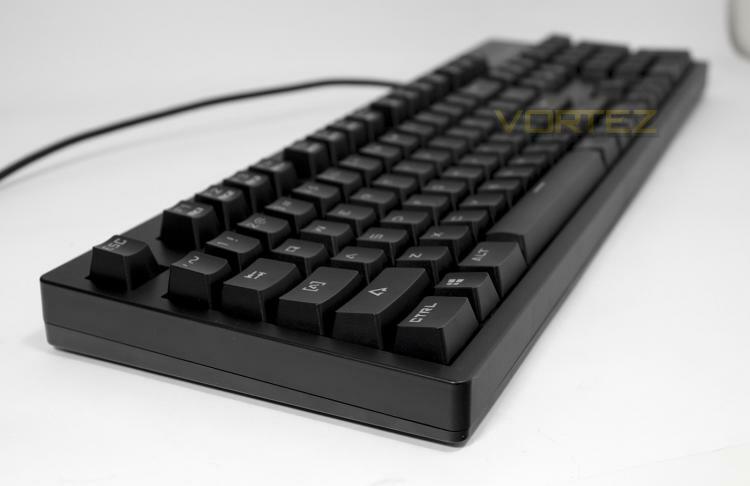 This doesn't appear to be due to the keycaps and is more likely down to the LEDs that have been used.